Rabin was born 16th July 1967 at the Whittington Hospital in Archway, London. His father Solomon was born in Calcutta in India of Iraqi Jewish parents and his mother Uma is a Bengali from a Hindu family. They are both retired teachers. Rabin attended the Cranbrook College Secondary school in Ilford, Essex. He then attended Ilford County High in Barkingside, Essex where he obtained four A-Levels at Grade A. He then went on to Queen Mary and Westfield College (now Queen Mary, University of London) where he obtained his first degree in the Department of Electrical Engineering. During his first degree he became interested in Computer Graphics, and attended the course given in the Department of Computer Science. Subsequent to this he started his PhD studies in Computer Science, specialising in graphics hardware for Bezier curves and surfaces. He obtained his PhD entitled An Adaptive Method for Rendering of Curved Surfaces in 1994. After he completed his PhD he joined Canon Research Europe, which eventually became Criterion, responsible for the widely used Renderware for graphics programming. Rabin's role was mainly concerned with making this software, and computer games that were based on it, work as fast and efficiently as possible on every conceivable variety of consumer graphics hardware. He was one of the few engineers in the world capable of doing this. 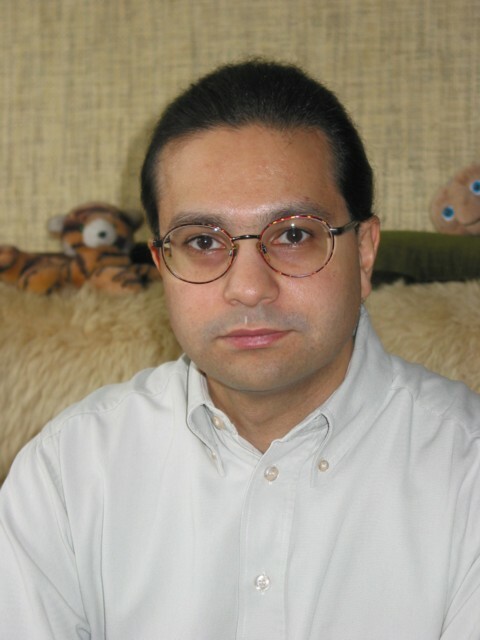 Rabin joined Canon Research Europe in May 1993, as a software engineer in the Computer Graphics Group. The work done there led to the creation of Criterion Software the following year, making a product called RenderWare - software to create high-performance, real-time 3D graphics on a large variety of computer hardware. He was pivotal in RenderWare's development, and much of his early work involved getting hold of early examples and prototypes of new graphics hardware from various manufacturers and working out how to get the most out of them - something at which he was a true expert. A few years after he joined the company, he started working on a new version of RenderWare that was aimed primarily at videogames developers, to help them get good results more quickly from the latest games consoles, such as Sony's PlayStation2. The games industry was faced with the problem that Sony's new machine was far more complex to program than previous consoles, and Rabin was given the job of trying to understand it and work out ways to allow RenderWare users to get great results. Over the next few years, Rabin's work was a big factor in RenderWare becoming one of the most widely adopted development systems in the games industry, being used in hundreds of games including top-selling franchises such as Pro-Evolution Soccer and Grand Theft Auto. He also found time to help out Criterion's own game development division, fixing cruicial problems and offering advice to the teams that was invaluable in getting their games, such as the Burnout series of racing games, finished to the highest quality. Rabin was an active participant in the PlayStation2 developer community, offering help to other developers, and quickly becoming recognised for his expertise. He left Criterion in 2004 to join Sony Computer Entertainment Europe to continue his work on their advanced videogames consoles. Outside of work, one of Rabin's interests was Role Playing games. This is an activity involving sitting around acting out a story together. Over many years, since the late 1980's, Rabin participated in these games as part of a group of friends and he was a funny and clever player. While he was certainly a quiet and private person, his personality shone in this social setting. The same group of friends often met up outside of gaming sessions and Rabin would always make a great effort to come along despite his busy working life. He enjoyed sharing the company of his friends along with some good food and drinks and was able to converse on practically any topic with expertise. It was a running joke that Rabin seemed to know practically everything there was to know, about any subject, but he was extremely modest about his knowledge and abilities. Rabin passed away on Monday, June 27th while he was in Malta on company business, after having been taken ill with pneumonia. His funeral took place on Wednesday 6th July, at the City of London Crematorium. This web site is set up by his many friends and his family as a testimonial to his life and preservation of his memory. We have many memories and thoughts to share, and over the next few weeks, months, years, will be writing our recollections - so that Rabin lives on in our thoughts, in our hearts, and we make his life known to an ever wider group of people. We hope that you will contribute to these pages if you knew Rabin, and if you never had the chance to meet him - you will meet him now through these pages. The Rabin Ezra Scholarship Fund offers a bursary to doctoral students in computer graphics, imaging and vision. For more information about the scholarship and how to apply, please check out the fund information page.